The coconut revolution is truly upon us. I remember when we first started buying cold-pressed coconut oil over a decade ago. It was hard to find and very expensive. Now the food world has realised the wonders of coconut and I’m very glad to say not only is coconut oil cheaper and easier to find, but there is a wealth of other coconut products out there to choose from. Other than drinking the coconut ‘milk’ as I’d always called it out of fresh (ish) coconuts, I’d never had commercially bought coconut water until last year. I was very excited about it as it’s thirst quenching, tasty and good for you without being overly sweet. 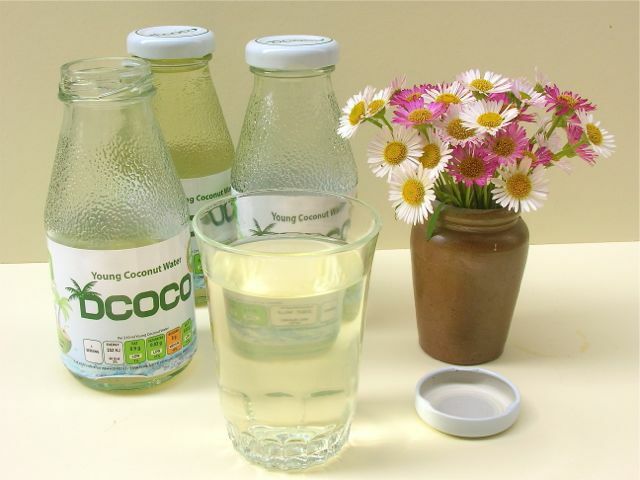 DCOCO is young coconut water and is bought to us from Portsmouth by Debbie and Venky Ltd, a fourth generation family of farmers with roots in India and Sri Lanka. The water is harvested from young King coconuts which are cultivated specifically for drinking and is the first such available in the UK. It is naturally healthy, being rich in potassium, calcium, magnesium, phosphorous and sodium. Indeed one bottle contains more potassium than a banana. It is said to increase the metabolism, thus aiding weight loss and also to have anti-aging effects. I really must drink more of it. The coconut water comes in handy little 210ml glass bottles, which can of course be used after consuming or just recycled. I make lots of cordials and sauces and these bottles are just the right size for keeping them in. They are also a good size for shaking up a cheeky cocktail or two for a summer’s picnic. Each bottle has only 60 calories, is low in fat, saturates, sugar and salt. The only addition made is vitamin C, none of the added sugar, colours and preservatives that are found in many sports drinks. I was sent a case of twelve bottles to try and DCOCO has kindly agreed to offer up a similar case to one Tin and Thyme reader. The young water tastes fresher and sharper than the mature coconut waters I’ve tasted in the past and is wonderfully thirst quenching as well as refreshing. As CT and I had only 6 bottles each, it’s hard to tell if it’s made us any healthier, but we like to think it has. Thanks to Debbie and Venky Ltd for the young coconut water. There was no requirement to write a positive review and as always all opinions are my own. Debbie and Venky Ltd has kindly agreed to give one Tin and Thyme reader a case of twelve 210ml bottles DCOCO. To be in with a chance of winning, please fill in the Gleam widget below. You will need to leave a comment on this post, answering the question, which then gives you additional chances to enter if you so wish. Gleam will pick a winner at random from the entries received. If you are commenting anonymously, please give me some way of identifying you as I will be verifying the validity of entries. Any automated entries will be disqualified. This giveaway is only open to those with a UK postal address. Winners will need to respond within 7 days of being contacted. Failure to do this may result in another winner being picked. Prizes are offered and provided by Debbie and Venky Ltd and Tin and Thyme accepts no responsibility for the acts or defaults of said third party. Tin and Thyme reserves the right to cancel or amend the giveaway and these terms and conditions without notice. Do take a look at my giveaway page to see if there is anything else you would like to enter. Being at the funfair with my parents when I was very small, pleading with my dad to try and win me a goldfish – I’m sure he tried to miss on purpose!!! I always feel better for drinking coconut water, i’m sure it hydrates me far better than anything else. I love the taste too, and enjoy trying different brands. My dad used to buy us coconuts and we would watch him as he used a hammer and nail, then would pour a smidgen of water into a glass for us to share. Tried coconut water for the first time this weekend and it’s delish! I agree with you totally Chris – bring on the picnics I say. The smell always reminds me of going to the USA as a kid. I don’t know what suntan lotion my Mum used but it smelled of coconuts and it takes me right back to being in Disney World 🙂 . Coconut Ice at many a seaside shop when I was younger. A long holiday to hawaii we had in 2013. Tropical beaches – they are so often pictured on long, white, sandy beaches with hammocks strung between them. Malibu, Bounty, Hot sunny days, suntan lotion and Sandy beaches. Coconuts make me think of holidays, the scent of suncream and Bounty chocolate bars! Realising I couldn’t throw very well as a child! Oh no Natalie – not good associations for you then. Coconut shy’s at the fair when I was younger! Coconuts make me think of desert islands,paradise,cocktails,beaches and hot weather.oh and those specially trained monkeys that climb the trees to pick the coconuts and throw them down. Trips to Great Yarmouth with my grandparents. My grandad organised the bus and wrote numbers on the bus wheel. We stopped every half hour and the number that was nearest to the arrow he had drawn were given a small prize – wonderful memories! What a good story Jen and wonderful memories for you too. When I was little and my dad won me a coconut at the fair! Cakes, coconut ice, raw chocolate truffles rolled in coconut, madeleines, and bounty bars. Reminds me of holidays with sun kissed beaches, walking along picking shells, and I can’t forget bounty chocolate. The taste of Pina Coladas in the holiday sunshine. Tropical beaches and Hull Fair coconut shies! A dream holiday I haven’t been on yet, drinking Malibu by the beach. it reminds me of being in Brazil during the world cup. Memories that will never leave me! Is what coconuts mean to me. Hehe, love it John.Thank you for that and good luck. Either drinking water from fresh coconuts in the Caribbean or Bounty bars! St Lucia. I ate one off the tree in 1998. Coconuts make me think of old-fashioned cakes with dessicated coconut toppings, believing when a teenager that Malibu and lemonade was really sophisticated and Thai green curry. The song by Harry Nilsson. makes me think of beautiful white sandy beaches with bright blue sea, warm weather, sunbathing whilst reading a great book and drinking an ice cool cocktail. They remind me of my honeymoon in Thailand where we drank lots of coconut water fresh from coconuts. Coconuts remind me of a tropical holiday, somewhere hot and exotic! My husband because he loves coconuts and is always on at me to get him coconut water from the supermarket! Not very original but coconuts bring to mind sunshine, sea, pina coladas and happy times! As a child winning a coconut and being given ‘the milk’ was slightly confused as it tasted nothing like milk. Yes, milk is a bit of an odd name for it Diana and I think I had the same experience initially. Oh no Samantha, you must give those fresh coconuts another try! Coconuts always make me think of the fair – and failing to knock any over at the coconut shy! They always remind of me of being rubbish at the coconut shy during seaside holidays with my parents. But I’d always insist on having a go. Hmm coconuts make me think of white-sand beaches, memories of India and incredibly tasty food. Coconut water is so refreshing isn’t it. Coconuts definitely remind me of holidays that I have had in the Caribbean. beach holidays with lots of sunshine and palm trees. Also thai curries! Holidays, hot weather and the ocean. Haha, yes. I remember it felt very ‘daring’ to be throwing food around the place. Coconuts always make me thing of the wonderful way in which species travel around the world. Floating coconuts washing up on beaches are just the tip of the iceberg! Quenching my thirst in Rio. I love coconut. Shouldnt say this I know, but Bounty is the king of chocolate sweet stuff! Anyway any chance i get to use Coconut oil, I take it. Put it in my morning coffee, cook with it and also put it on my hands (if dry and cracked). Smells good, tastes good. Never tried DCOCO and looking forward to it. Coconut oil in your coffee Scott? Now that’s first surely. Pina Coladas and getting caught in the rain 🙂 tropical times really! They make me remember when I was young, and coconuts were a seldom-ssen treat; and the difficulty we had getting them open! Being in Thailand (or any tropical country), staring out to sea and drinking straight from the coconut (then eating the meat after). Dreamy. I’d imagine that this is a great way to stay hydrated, I really love the taste of coconuts! They make me think of dropping them on our old patio slabs to crack them open, and them eating the lovely milky flesh. Tropical times and holidays abroad! Warm weather, oceans, beaches and exotic destinations. They remind me of being on holiday in Antigua and watching people climb the trees to bring down a fresh coconut for us all to try! A great way to hydrate, makes me think of fun with the kids opening coconuts and scraping out the lovely coconut inside! Cocktails with umbrellas and a straw put into the coconut. Also, using two halves when we were younger to make a bikini top! I never did make it as a clothes designer, wonder why? It reminds me of my childhood and the coconut tree outside my bedroom. A deserted desert island with palm trees full of refreshing coconuts. made “me” think of curry…? Laying in the sun on a tropical island surrounded by palm trees with the waves gently lapping on the beach. The coconut shy at the funfair on our village green when I was young and trying to hit the coconuts off their stand with a floppy beanbag and a rubbish shot, no chance! My son, he loves coconut water. I had to ask our local coop store to order it in specially for him! Coconuts make me think of the beach and the sun and dessert! They make me think of white sandy beaches, the beautiful blue sea, somewhere hot. They make me think of my second home that is the Philippines. Nothing better than picking them straight from the tree to enjoy in such glorious, scorching heat. I can well believe that’s where they would be at their very best Keturah. Coconut water is a great alternative to water after or during a hard workout. Coconuts make me think of deserted islands and how happy you’d be to have coconuts if you were stuck on one! Coconuts make me think of the sun and cocktails and the beach! Love the smell and love the taste! Swinging in a hammock sipping Pina Coladas! They make me think of curry, especially kormas! I Also love coconut cake too! Beaches fringed with palm trees and those bras made from two halves of a coconut shell! It reminds me of lots of different things actually! Holidays, sea, sand and suncream. Trying to break into the old coconuts we won at funfairs with a hammer but they were always dry and old inside. Oh I remember those disappointing coconuts too – such a shame. And yes, coconut oil makes a fab moisturiser. It’s meant to help protect from the sun too I believe Christina. Love to buy alternative milks and healthy waters and this one sounds delicious. Coconuts make me think of palm trees and rum cocktails!! Coconuts make me think of popcorn. I make it at home using virgin coconut oil and it turns out amazing every time. Ooh what a lovely idea Nora. I shall try that. LESS MIGRAINES it sounds strange but its true – this is what coconuts make me think of. Coconut water provides me with electrolytes which prevent and help ease my migraines. Now I have tried it I wouldnt be without it. This prize would be great for me as the amount I have to buy works out quite expensive. That’s really interesting Carolyn and not something I’d heard about before. Good luck. I am absolutely fan of coconut water! Love the taste, the smell, everything! Like this giveaway a lot! Coconuts remind me of tropical holidays by the beach, sipping cocktails! Coconuts make me think of my childhood in Africa. You could buy coconuts from roadside vendors, who would hack off the top of the coconut with a couple of strokes of a machete. I always wondered how they managed to avoid cutting themselves. I especially loved young coconut, where you drink the “milk”, then use a spoon to scoop out the soft flesh to eat. Coconut oil is good for treating acne. They take my back to my childhood, attending local fetes with coconut shys. A coconut cake I make with Malibu, its delicious served with coconut ice cream, also Thai food. So coconuts make me think of food!! I like the sound of your coconut cake Helen. A tropical island getaway with the family. Coconuts make me think of tropical beaches and hot sunny weather…they make me want a holiday! monkeys on a desert island swinging in palm trees in the Caribbean sunshine! Ooh yes, I’d completely forgotten about that, but we did it too. Coconut water reminds me of the caribbean. they make me think of summer. faye. Sunny beach with palms and clear blue water. Makes me think of tropical scenery with bright sunshine, clear blue sea and lush foliage. Coconuts make me think of Palm Trees on crisp white sandy beaches of a desert island. Long hot summer days, holidays at the beach, coconut ice cream, sun tan lotions. They make me think of summer, coconut water is just so refreshing it’s like being at the beach! Coconuts make me think of all the lovely curries I can make using their milk. Oh, and Bounty chocolate bars. They make me think of exotic places and weather. Normally when I see it in a food I have to give it try purely because of that imaginary. Reminds me of when I was a young teenager and I used to buy coconut scented smellies. I love coconut water. So refreshing – and so low in calories! This would be a fantastic prize to win. Summer as a kid we always were smothered in Coconut Suntan Lotion. Palm trees and beaches on an 80s Bounty advert. Oh, and never winning the coconut shy! They make me think of my first holiday to Spain when I was little. There was an ice cream shop and I thought it was brilliant because of all the different flavours they had. I always chose coconut. Makes me think of healthy fresh fun times in the sunshine, relaxing and revitalising! ive never tried coconut water and i really want to !! sounds great! A tropical island with white sand, soaring temperatures and no other people. Refreshing & rehydrating, and the sweetness of a dark chocolate Bounty bar – or a coconut mouse with string for a tail! They remind me of my childhood, attending local fetes with coconut shys. They make me think of paradise islands with white sand and palm trees laden with coconuts. Coconuts make me think of delicious pineapple and coconut fruit juice. Your mum sounds fantastic. Love the idea of a coconut feast and homemade coconut ice with real coconut. Holidays! The smell of suncream! Coconuts make me think of relaxing on a tropical beach in the shallow breaking waves. White sandy beaches, turquoise tropical sea lapping the shore lined with palm trees in beautiful sunshine! Tropical paradise whilst on a sunny beach in Kenya – care-free, no stress, no worries, just bliss! An exotic beach in the carribean – with people tossing them at tin cans to win a teddy. I tend to add coconut oil to my morning smoothies for the same reason Michelle. Coconuts make me think of my Mother who loves them still in their hairy shells. She likes the milk drank from the handy hole, and then, the fresh meat prized from the inner shell. It all looks like hard work to me .. but, I don’t mind helping her eat the ‘spoils’! They make me think of an exotic island somewhere with a gorgeous beach! They make me think of old fashioned fairs and the coconut shys. My childhood, My Dad was a Scout Leader and he used to run the Scouts fundraising coconut shy. He would always bring home the coconuts that he had left over. That’s lovely Lynne. What did you do with them all? Coconut water tastes great and is good for you too- not many drinks can say that! Reminds me of holidays, lovely. COCONUTS MAKE ME THINK ABOUT BEAUTIFUL, SANDY BEACHES SOMEWHERE EXOTIC AND HOT. India! We used to drink coconut water every day! Coconut shies at the fair, pina coladas, pastries from the bakery with shredded coconut on them and the smell spells summer. Tropical holidays, I sometimes wonder if the coconuts ever fall on people’s heads! Palm trees, the sun, and weirdly enough bounty chocolate bars! Coconuts make me think of holidays in the sun. Tropical summer holidays on a beach, or school fetes in the old days with the coconut shy stall. It reminds me of when I lived abroad as a child and I had coconut all the time. They make me think of summer fates when I was younger and breaking them open in the driveway with the boys next door. Tropical holidays & Malibu and lemonade ! They always remind me of after school when me and my friend would pop into her mum’s greengrocers and we were allowed to have one and drink the juice out of it.